TheStreet, Inc. (NASDAQ:TST), a leading digital financial media company, today announced that it has completed the acquisition of The Deal LLC from Wasserstein & Co. Founded in 1999 as The Daily Deal print newspaper, The Deal LLC transformed its business into a digital subscription platform that delivers sophisticated coverage of the deal economy, primarily through The Deal Pipeline, a leading provider of transactional information and services. The Deal Pipeline was created for organizations seeking to generate deal flow, improve client intelligence and enhance market knowledge. It provides full access to 100-plus pieces of proprietary commentary, analysis and data produced every day by The Deal’s editors and journalists and can be customized based on each client’s job function, deal focus and workflow and delivered straight to a mobile device or existing corporate platform. The acquisition of The Deal will advance the strategic objectives of TheStreet by increasing both subscribers and content. The Deal’s marquis customer base of 40,000 professionals, including senior-level bankers, law firm partners, private equity partners and hedge fund notables provides substantial predictable recurring revenue with high renewals and attractive margins and has continued to grow despite the deep cyclical downturn in the M&A market. 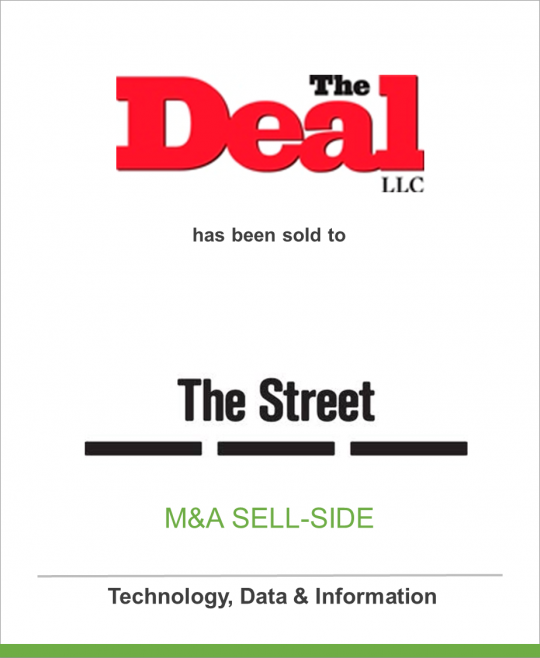 The content-creation and marketing resources of The Deal and TheStreet will be leveraged to create new revenue opportunities for the combined company. Specifically, The Street’s buy-side newsroom content will be incorporated into The Deal Pipeline to accelerate sales to hedge funds, TheStreet’s Chat-on-the-Street product will be added to the product set sold by The Deal’s enterprise sales force, The Deal Pipeline will be marketed across the entire network of The Street, creating a substantial increase in qualified leads, and The Deal’s content-rich offering, such as webinars, will be offered to TheStreet’s customers. These strategic and operational opportunities, when added to significant corporate synergies, will be accretive TheStreet’s consolidated adjusted EBITDA. “This is a terrific combination that grows the most profitable portion of our business, subscription revenues,” said Elisabeth DeMarse, CEO of TheStreet, “The Deal is a prominent and well-respected brand that the market will intuitively associate with TheStreet, creating new revenue opportunities for both businesses at minimal incremental cost. TheStreet, Inc. is a leading digital financial media company that distributes its content through online, social media, tablet and mobile channels. The Company’s network of brands includes: TheStreet, RealMoney, RealMoney Pro, Stockpickr, Action Alerts PLUS, Options Profits, Chat on TheStreet, MainStreet and Rate-Watch. For more information on TheStreet’s business, visit www.t.st. For financial and business news, actionable trading ideas, stock quotes and more, visit TheStreet.com, follow TheStreet on Facebook and Twitter, visit TheStreet.mobi from your mobile device and access TheStreet through all major tablet platforms. For more information on The Deal, visit www.thedeal.com. Wassertein & Co., L.P. is a leading independent private equity and investment firm, focused primarily on leveraged buyout investments and related investment activities. The firm manages capital on behalf of its institutional and individual investors, including public and corporate pension funds, foreign governmental entities, endowments and foundations, and high net worth individuals. The firm historically has made investments in media, consumer products and other industry sectors. Wassertein & Co. conducts its activities through offices in New York and Los Angeles. For more information, visit www.wasserco.com. All statements contained in this press release other than statements of historical facts are deemed forward-looking statements as that term is defined in the Private Securities Litigation Reform Act of 1995. Such forward-looking statements are subject to risks and uncertainties, including those described in the Company’s filings with the Securities and Exchange Commission that could cause actual results to differ materially from those reflected in the forward-looking statements. All forward-looking statements contained herein are made as of the date of this press release. Although the Company believes that the expectations reflected in the forward-looking statements are reasonable, the Company cannot guarantee future results or occurrences. The Company disclaims any obligation to update these forward-looking statements, whether as a result of new information, future developments or otherwise.